The QX1 is by far the most interesting lens camera from Sony so far. It has an APS-C sensor (the same in size as those in Sony’s line of interchangeable lens cameras and DSLRs) and uses the E Mount to allow multiple lenses to be used. 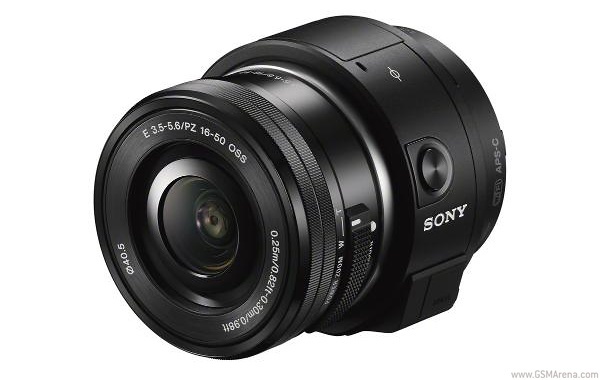 The Sony QX1 appears to be using the Sony α5000 as a platform. It uses the same 20.1MP 3:2 APS-C (23.2 x 15.4mm) sensor with 25 contrast detect autofocus and Sony’s fast Bionz X processor. It will retail for $399 without the standard 16-50mm lens and $450 with it. The Sony QX30 has an Xperia Z3-sized 1/2.3″ Exmor R CMOS sensor 24mm wide lens that goes all the way to 720mm (in 35mm equivalent) and be able to capture images up to an insane 12,800 ISO (the same as the Xperia Z3). The QX30 will allow for 30x optical zoom and even up to 60x zoom using Sony’s ClearImage Zoom. Another addition to Sony’s portable imaging lineup is the ActionCam Mini – a portable wide-angle camera to challenge the GoPro series. It has an 11.9MP Exmor R sensor, 170-degree angle of view, 720p video at 120fps and supports Sony’s 50Mbps XAVC S video codec at 1080p resolution. The ActionCam Mini will retail for $250 or $350 with the live-view remote that allows you to control more than one ActionCam (up to five) and make adjustments.